Jesper may not be a jinx, but he sure has a difficult time making things come out the way he envisions them. 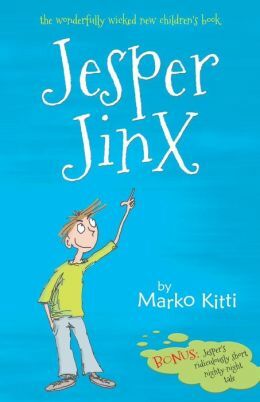 The first several pages of the book provide an introduction to eleven-year-old Jesper and all his quirks. The author tells the readers they are sworn to secrecy about the fact that this book even exists. Jesper wouldn’t want his antic shared so widely. Then the reader hears two short stories about the workings of Jesper’s world. In the first story, Jesper and his snow white cat tangle over a water glass containing the leavings from a water color brush. A load of red laundry and yellow towel are also involved. (The cat wins the battle. Jesper is no longer bored.) Then the reader gets to hear from the cat. In the second story, Jesper and his friend plan and carry out tricks on their teacher. Turns out they are sharing their secrets with the wrong person. Reminding the reader things are not always as they seem. The author does a lot of asides, speaking directly to the reader and thus drawing them into the conspiracy that is Jesper. This is a great device, especially for third graders, who are still getting comfortable with the chapter book concept. The silly and hilarious adventures are enough to keep kids engaged and will remind them to be kind and think about their actions before carrying them out. The familiar themes and quick pace should help with literacy skills and comprehension. Find out more at www.jesperjinx.co.uk.